The Pilgrim hydraulic Ringjack has been designed and developed to facilitate the smooth assembly of taper mounted products onto a shaft in many applications, however commonly used in the Marine industry to mount propellers, tillers, pintles and rudderstocks. It is of robust construction and incorporates a high pressure sealing system. 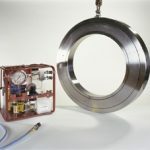 The Pilgrim Ringjack’s compact design is suitable for mounting on to the screwed nut of a typical propulsion or steering assembly to provide axial push-up and final positioning. The MK10 MorPress pump is ideal in providing the hydraulic pressure required by the Pilgrim Ringjack. When hydraulic pressure is applied, the piston of the Pilgrim Ringjack extends, in the process pushing the propeller or rudder along the tapered shaft. The applied pressure and travel of the piston corresponds to the required push-up distance of the application. The Pilgrim Ringjack can be supplied either plain bored or threaded and designed to suit the customer’s specific dimensional requirements. The standard range of sizes incorporates 245mm to 720mm bore.